Get up at 3 am this morning to walk to the summit of Mt Batur (approximately 1.5–2 hours). 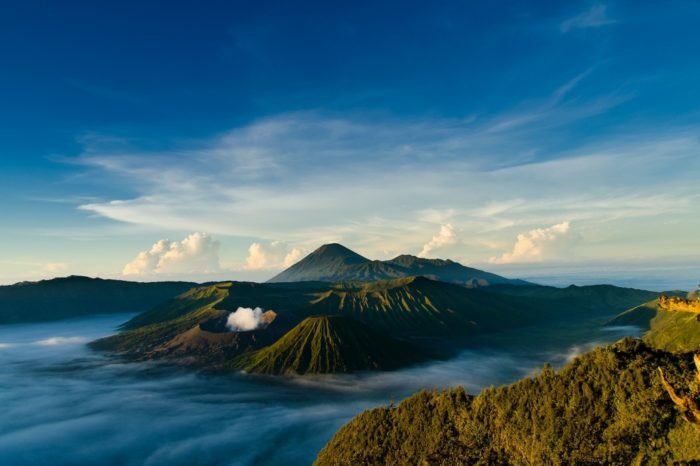 You’ll be glad you made the effort to rise early when you see the gorgeous sunrise over the valleys of Bali. On a clear morning, it’s possible to see all the way across the Lombok Strait to the peaks of Lombok’s Mt Rinjani. This may well be one of the most memorable parts of your trip. Do keep in mind, however, that the weather can be unpredictable and sometimes the view is obscured by clouds. After descending the volcano, there’s an option to soak in hot springs with fantastic views over the lake and caldera. Make the journey from the mountains to the small coastal town of Lovina (approximately 3 hours). Lovina is famous for the dolphins that patrol its coast. It’s also a great spot for fine food, traditional massage and yoga. On the way back stop at Banjar Hot Spring, a small spring popular with the locals. Tonight we head to Ibu Wayan’s to learn about Balinese cuisine and have a home cooked meal. 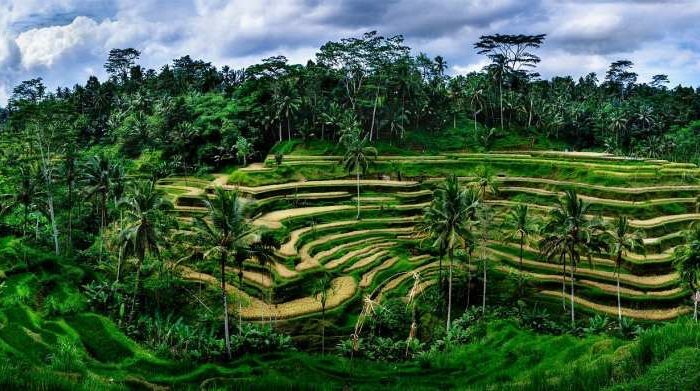 Visit the Bali Botanical Gardens in Bedugal, where over 2000 species of plants from all over Indonesia are on display in a tranquil highland setting. Continue by minivan to Sanur (approx. 2 hours), and enjoy some free time this afternoon. Travel by minivan from Sanur to the port of Padang Bai (approximately 1.5 hours). Then you’ll take a fast boat that takes you from Bali to Lombok (approximately 1.5-2 hours). Then take a bus to Tetebatu (approximately 2 hours). On the way stop in at Puyung Village, located in central Lombok, a small village that you won’t find in your guide book. Enjoy a traditional home-cooked lunch in the simple home of local family. The hill retreat of Tetebatu is situated in the centre of Lombok, at the southern base of Mt Rinjani, and boasts spectacular views. 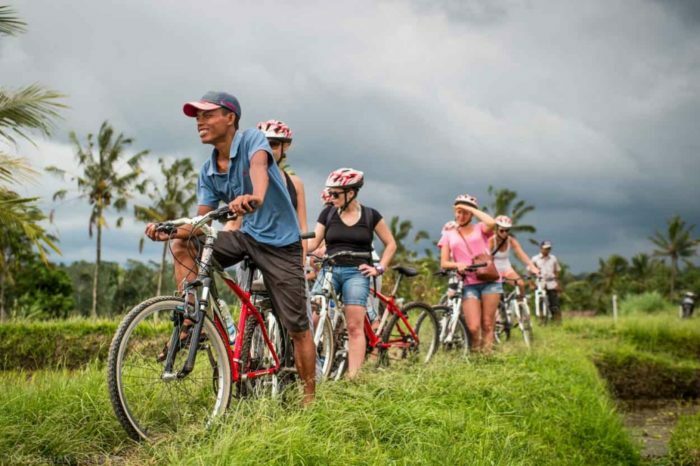 Enjoy a guided walk through lush rice fields and see how the region’s farmers have tended the land for centuries, still using traditional water buffalo ploughs. Climb a little higher and pass through clove and coffee plantations and stop at a local warung to try some local coffee (approximately 2.5 hours total). Visit the local village of Pringgasela to learn traditional weaving and enjoy a delicious Sasak feast. In the afternoon return to the hotel, then travel to Labuan Pandan on the East Coast of Lombok. This remote beachside location is little visited by tourists. Tonight we will stay in our bungalow accommodation amid the peace and quiet of the secluded coast. Take a trip out to the nearby coral reef and enjoy some fantastic snorkelling off the boat. Stop in at a secluded island for lunch with Mt Rinjani towering over Lombok. Travel by minibus around the spiritual centre and sleeping giant of the island, Mt Rinjani (approx 2 hours). Arrive around midday at Senaru, a small, rustic village nestled between the base of Mt Rinjani and the edge of the jungle. Take a guided tour of the local Sasak village to learn about the history and culture of these people who have long lived on the slopes of Mt Rinjani. Here our local guide is part of a female guiding association that trains and develops women in tourism. Here we also take a walk to the spectacular Tiue Kelep waterfall, passing by Singang Gila waterfall, and perhaps swim in the waters which are considered by the Sasaks to have healing properties. Your accommodation tonight is more basic, as the options in this part of Lombok are very limited. Continue to the west coast today by minibus (approximately 2.5 hours). The Gili Islands (Tiga Gili) are an archipelago of three small islands – Gili Trawangan, Gili Meno and Gili Air. Transfer by small boat to Gili Air (approximately 30 minutes), where you can take in the breezy atmosphere and stroll down stunning white beaches that rival those of the neighbouring islands. Your hotel is about a 15-minute walk from the port. Your bags can be transported by Cidemo from the port to the hotel. The island is your oyster and today is completely free to relax or explore. Perhaps take in another snorkelling trip, or catch a ferry across to the other islands of Gili Air and Gili Meno and see who has the better beaches. This evening, feast on a delicious dinner of local seafood as you say farewell to your fellow travellers. If you are flying out of Bali Denpasar Airport, or Lombok International Airport, please allow enough time for boat and land transfers before your flight. We suggest you don’t book flights before 6pm from Bali or 1pm from Lombok. Check out time from the hotel is 11.30am.